Here’s the richest of the tea-flavored ice cream recipes I made for my Mad Hatter’s Birthday Party. I tried a cardamon flavored recipe last year – I definitely liked this better with the richness of the mixed spices and tea. One of my friends was surprised that in America Chai meant a sweetened, spiced creamy tea mixture since she first heard “chai” simply as the Russian word for tea. Chai is also simply the term for tea in India: so “chai tea” is really completely redundant. Masala chai is spiced tea – regular chai may also have milk and sugar, in the British manner, but it doesn’t have the aromatic spices. Did you know one reason the British wanted to colonize India was to create a market for tea? The first Europeans went there for spices, but changing fashions in European ideas of digestion & tastes in cuisine made spices a less profitable export by the time the British began to build their empire. The British had already pushed into China’s tea industry, though, and those merchants saw a new audience for those wares and began to experiment with growing tea in the mountains of India and encouraging its consumption wherever they could as they gained power. This recipe uses whole Indian spices, which may be expensive or difficult to find if you don’t have access to a range of imported Asian ingredients at your grocery stores. If you get them, though, you can make delicious masala chai anytime you like. Cooking the ice cream also takes a few extra steps – you need to give it time to infuse the whole spices, then the tea for a shorter period. After the infusions it’s cooked into a very rich custard, which takes some careful stirring to get it the right consistency without burning it. The custard should cool completely before it can be chilled – so this isn’t a recipe you should take on unless you have an hour or two to work on it a day or two before you plan to serve it. The flavor is wonderful, though, and the texture is so rich and creamy my sister described it as “buttery creamy” – worth it for a special occasion. 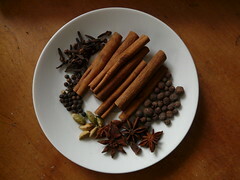 Heat 2 cups half and half and the chai spices – star anise, cloves, allspice, cinnamon, peppercorns, and cardamom pods, and a pinch of salt until steamy and hot to the touch. Use a heavy-bottomed pan if you do this If you want to be specific or have a probe thermometer, have it go to 150 – scalding the milk, not boiling it. 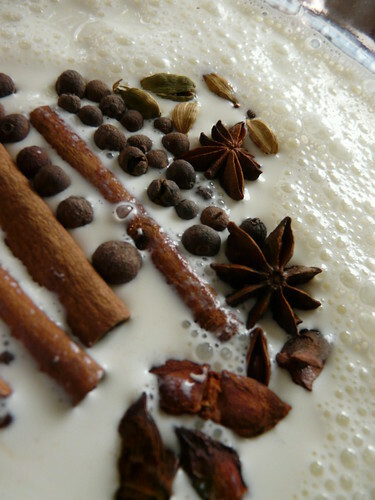 Cover and let stand for 1 hour to infuse the spices into the milk. Reheat the mixture until steamy hot again (again not boiling), add the black tea leaves, remove from the heat, stir inthe tea and let seep for 10 minutes. Use a fine mesh strainer to strain out the tea and spices, pouring the infused milkcream mixture into a separate bowl. Pour the milk cream mixture into a heavy bottomed saucepan. (Note: these are the initial instructions – you can skip them if you are very careful with your timing and switch containers quickly to get it off the heat). While the tea is infusing in step 2, prepare the remaining 1 cup of cream over an ice bath. Pour the cream into a medium size metal bowl, set in ice water (with lots of ice) over a larger bowl. Set a mesh strainer on top of the bowls. Set aside. Beat the egg yolks and the sugar until thick and light lemon colored. Slowly pour a little of the heated milk creammixture into the egg yolks, whisking constantly so that the egg yolks are tempered by the warm mixture, but not cooked by it.Scrape the warmed egg yolks back into the saucepan. 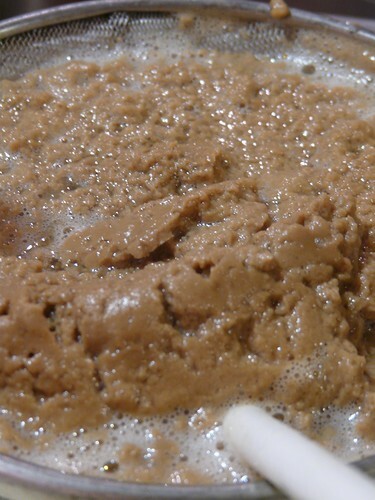 Return the saucepan to the stove, stirring the mixture constantly over medium heat with a wooden spoon, scraping thebottom as you stir, until the mixture thickens and coats the spoon so that you can run your finger across the coating andhave the coating not run. This can take about 10 minutes. The minute this happens the mixture should be removed from heat. Pour the custard through the strainer (from step 2) and stir into the cold cream to stop the cooking. (Or put it into anew container and stick in the fridge) Once initially chilled in the ice bath, chill the mixture thoroughly in therefrigerator (at least a couple of hours). Freeze the mixture in your ice cream maker according to the manufacturer’sinstructions. Store in an airtight container in your freezer for several hours before eating. Note that the ice cream will be quitesoft coming out of the ice cream maker. It will continue harden in your freezer. If stored for more than a day, you may needto let it sit for a few minutes to soften before attempting to scoop.